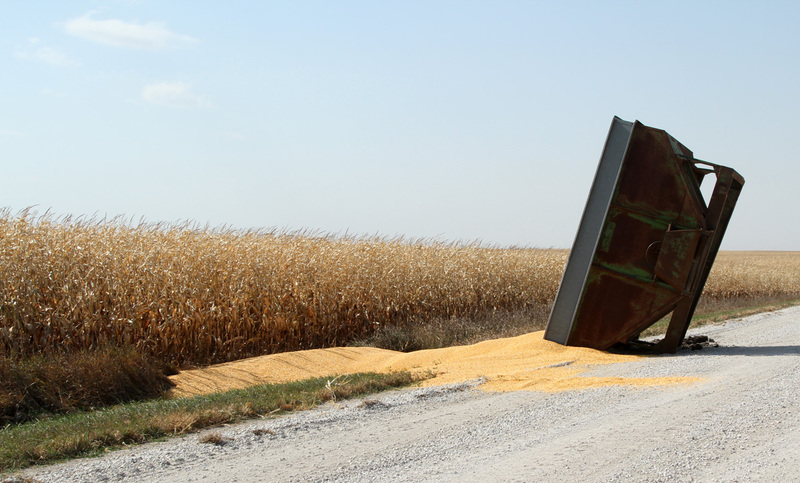 I have no idea whose wagon this is or what caused it to tip over spilling grain into the ditch. Nor do I know what happened to this wagon’s wheels. What I do know is that it has been windy and extremely dry in northwest Iowa. There have been many spontaneous fires burning fields, and concern of even more if there isn’t rainfall soon. This entry was posted on October 7, 2011 at 11:28 pm and is filed under Uncategorized. You can follow any responses to this entry through the RSS 2.0 feed. You can skip to the end and leave a response. Pinging is currently not allowed. Your post and the recent news of Dennis Backstrom are definitely reminders of harvest hazard. It’s not ours, Louise! Though once, many years ago, Bette was driving home one or two empty wagons. She turned off the north road onto our road, and a similar thing happened. The wagon box ended up in the ditch. I assume her wheels came home with her also, as this farmer’s must have, still hooked to the wagon ahead of it. Nuts and bolts and a little welding due? Yes, it’s a scary time of year to me…especially this year! I’m always so glad when harvest is over! Some days you need to work on the equipment and stay out of the field. Could you send me the post and recent news on Dennis Backstrom?